Kristy Frivold, senior director, innovation lab at Sephora, said the partnership gives its “clients” a “convenient way to play,” since putting on makeup can require both hands. Note cards in the vanity area include the names of the products used in these specific command videos. 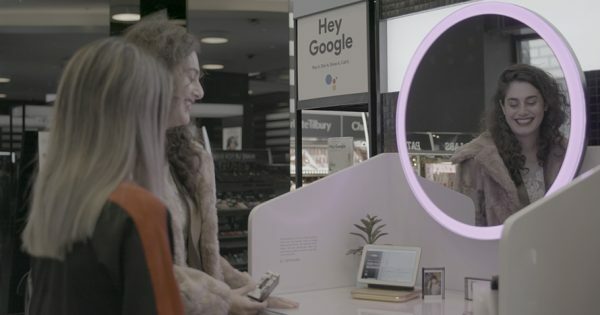 According to Frivold, the 10 stores chosen to showcase the Google Home Hub “receive a lot of foot traffic” and include locations like the Sephora store in Union Square in New York and the Michigan Avenue shop in Chicago. Google is also running a marketing campaign to promote the two companies coming together, that will include social and influencer content. It’s yet another partnership the Google Home is part of, having recently worked with Disney and Penguin Random House’s Little Golden Books, as well as Tasty, BuzzFeed’s food brand.